Donald Rumsfield visited the crash site of Flight 93 yesterday. I don't think I've seen a story of anyone else doing this. 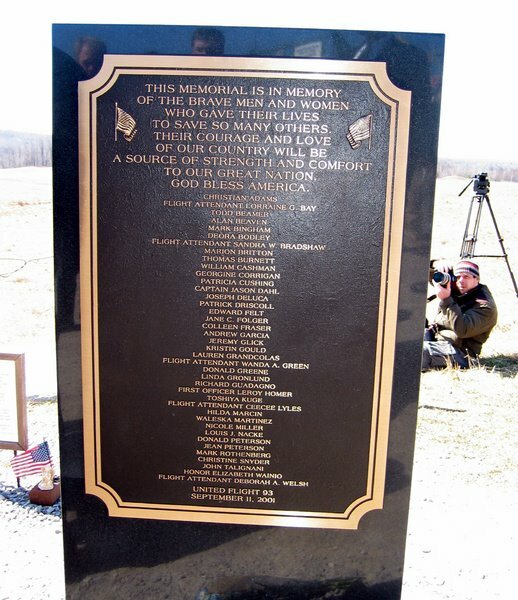 The real memorial to flight 93. 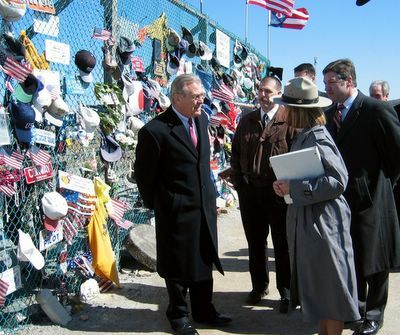 The things left by visitors; hats, flags, licence plates and flowers were left by people who thought it mattered that they leave something behind. Some folks even put up a 'temporary' plaque to honor the passengers. Good for them. Teresa Heinz Kerry is funding the clown posse that created the awful 'Crescent of Embrace' memorial to the highjackers. She hasn't been there, nor has John, I guess some places are too holy even for poseurs. Imposing bad architecture on the situation will detract from the meaning of that day. The current tributes are all 'bottom up' if you will, each one left there by a caring hand, not a corporate sponsor using half a dozen chums to impose a 'top down' memorial that misses the point.